Grown and Grazed is a local food truck located in downtown Ruston's Heard Freighthouse food park. Follow Grown and Grazed on Facebook and Instagram to see their ever-changing menu with dishes made from only locally produced ingredients. 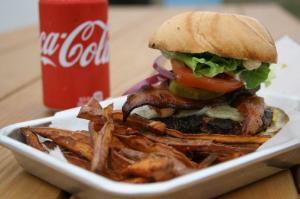 Favorites include the Louisiana sweet potato hash as well as the Smith burger with hand cut sweet potatoes fries. Weekends feature takeover chefs serving a variety of unique dishes!